Scuba Diving in Greece has a long history and tradition. The Greeks have for thousands of years been extremely close to the sea. This relationship continues until today. Diving in Greece is a surprising experience. The deep blue waters of the sun-lighted country, the distinct morphology of the seabed and the inexhaustible underwater scenery make it unique. Diving in Greece offers a lifetime experience. In the incredible Greek waters, you will discover amazing caves with stalactites, ancient, Byzantine and modern shipwrecks. The experience of light reflecting in the crystal clear waters and a world of colourful reefs, corals and fossilised plants. A fantastic world of marine life awaits you. The word diving comes from the ancient Greek verb “δύω”. The verb appears in Homer’s epics and the terminology diver later. The majority of divers were fishermen who collected shellfish, sponges, corals. Along with the fishermen, there were workers divers. These dives served the needs of the shipping industry and sailing precautions by conducting inspections on the condition of the seabed, the hull of a ship and the moorings. Diving in Greece could not have played an important part in wars and hostilities. Small groups of divers conducted underwater operations to sabotage enemy ships. The first historically recorded information on diving in Greece for sabotage occurs in the 5th century BC. It is the “famous” diver Scyli or Scylia, from Macedonia who served in the Xerxes fleet. Scylias swims a distance of 80 stadiums (about 15 miles), by diving. Reaching Artemissio, he informs the Greeks of the intentions of Xerxes. Subsequently, Diving in Greece for war purposes appears more and more often. Over the course of history, it is an established mean of marine or non-marine sabotage and information transfer. In ancient Greece, diving equipment began to develop for the first time. Depending on its purpose, the diver equips with tools that facilitate its mission. Since then, the primary goal has been to create tools that would give them more time underwater. The time spent underwater was a matter of holding their breath. Aristotle reports the first recording of an underwater breathing device, but without sufficient information. Every dive can result in an unexpected archaeological adventure. 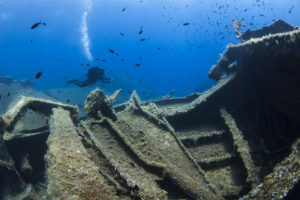 Shipwrecks dominate its seafloor as in countries with a long naval tradition. Wherever you dive, you can get a taste of Greek history or mythology that outlines this unique corner of the world. If you are lucky and encounter ancient discoveries, you should report them. You can see them but not touch or retrieve them. 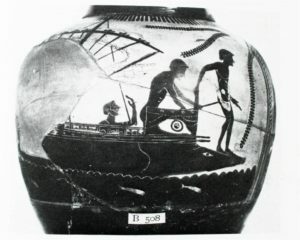 The law in Greece is strict in cases with archaeological finds. Diving in Greece is a journey into its underwater worlds. The waters offer spectacular visibility, from 6 to 50 meters depending on the season and the dive site. Mostly the sea of Greece is warm for an extended period of the year. The temperature ranges from 16 to 23 ° C (60 – 74 ° F). 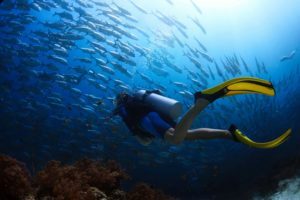 Care must be taken to supply the appropriate thermal equipment depending on the season and the dive site. The Mediterranean climate of Greece is warm and dry from July to September, averaging 27 ° C (80 ° F), while in the winter it is reduced to an average of 6 ° C (43 ° F). The island of Andros is the northernmost island of the Cyclades and the second largest. It has a coastline of 176 km, and its surface is full of mountains and contains many fruitful and well-watered valleys. The crystal clear blue waters of Andros are filled with exciting aquatic life, making it the ideal place for holidays and diving in Greece. The island has something for everyone, from archaeological sites and historical monuments. Green routes and golden sandy beaches for unforgettable holidays in Andros. The excellent tourist infrastructure and the extremely modern museums make Andros attractive for visitors from every corner of the world. The proximity of Andros to Athens has established it as one of the best places for diving in Greece. 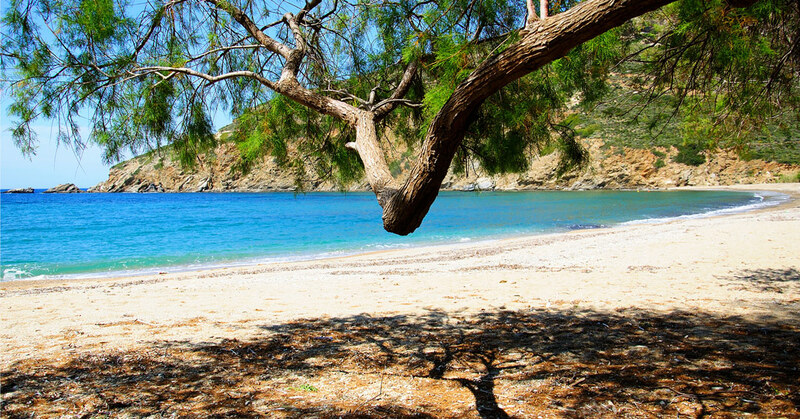 The connection of the island with other Cycladic islands makes it an ideal spot for adventure. Andros has mild weather throughout the most extended period of the year. Plenty of rain, compared to the rest of the Cyclades, is the cause of the lush vegetation of the island. Enjoy diving in Greece in the enchanting undersea world of the island of Andros. You will find the treasures of the Aegean in the blue waters. The island of Andros is surrounded by many shipwrecks and has plenty of aquatic life. 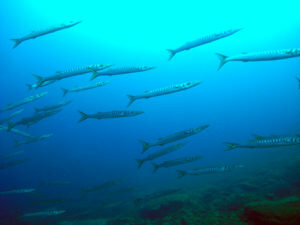 The clear visibility of the sea is ideal for the average diver. Our licensed diving masters will take you on an adventure under the sea that will take your breath away. Also, diving in Greece, in Andros will bring your experience to an entirely new level. We hope that those who dove with us will appreciate the fragile beauty and grandeur of the seabed. We believe that they will pass on this knowledge and awareness to others when they return to their everyday lives. We look forward helping you plan the perfect diving vacation in Andros. Contact us today to book your dive experience. 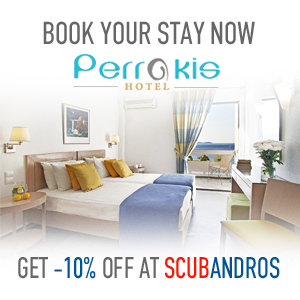 At ScubAndros in Perrakis Hotel, you will have access to everything you need for a memorable experience in Andros.